The Marina Riviera Nayarit is the most modern marina with most capacity for cargo in the Mexican Pacific; its facilities include a shipyard with the largest crane in the region. This is a traditional fishing village. If you’re into boats at all, the Marina Riviera Nayarit is the place to be: you can get there on your jet ski, your sailboat, yacht or even your mini-cruise ship up to 400 feet in length. 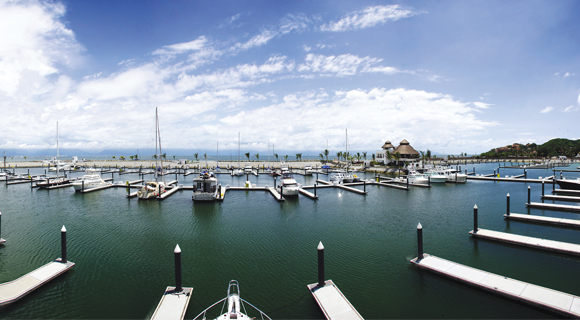 It’s also environmentally friendly and is the first marina in Mexico to win the coveted Blue Flag certificate. Interested in trying your hand at sailing? Visit the International Sailing Academy in La Cruz and learn from the best. The Yacht Club also offers a Sailing School for kids, teens and adults—and it’s always open! If you arrive by land or by air, the best option for accommodations is a luxury villa by the beach or in the mountains. Hungry? Stop by La Peska for a crispy fried whole fish, head to Frascati for a wood-fired oven pizza or try Columba’s for a surprising dish of green ceviche and fish meatballs. You’ll also love Eva Mandarina, a family-oriented and very colorful beach club. There’s always fresh fish and seafood here! Buy tuna, mahi-mahi or sailfish to make your favorite dishes. And on Sundays don’t miss the Tianguis Artesanal (Arts & Crafts Market) from 10 a.m. to 12 p.m. at the Marina.